Let the Tenant File link images and documents to your Rental Units. Easily choose the image you want and link it in seconds! Someone once said a 'picture is worth a thousand words'. Well, it might be worth more than that in money when you show your clients prospective rentals on the Tenant File screen. They will be impressed by the quality of the software you use to manage property. If you are the Owner, you can store an image for other reasons. For example, you might want to take a picture of your tenants, their car and license plate, the interior of the rental unit for check-in purposes, or you might want to scan and link an image of their lease or other documents. Use your digital phone, camera or scanner to create a picture, then link that image to any Unit address in the Tenant File. The process is easy and quick. Keep images of your houses, tenants, cars - anything! 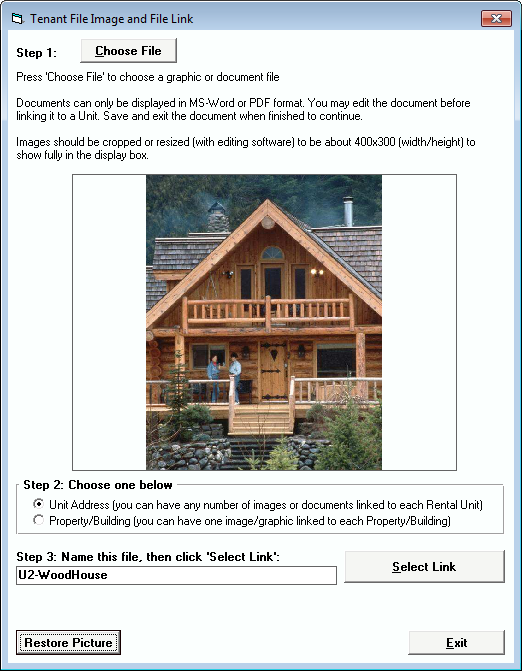 In addition to images, you can also link documents, such as Word documents, or PDF files. You can use this feature to attach a tenant lease to the rental unit.